Jo gained the Royal Veterinary College Veterinary Nursing degree, graduating with Honours in July 2006. She then joined Cedar Veterinary Group which introduced her to referral practice. In 2007, she became the cardiology nurse, a role she enjoyed immensely and gained a huge amount of experience from. 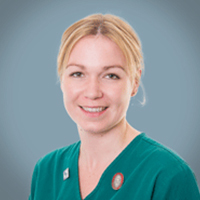 In 2008 she moved to SCVS and began working with the orthopaedic team, broadening her surgical nursing skills. She has also graduated with a Graduate Diploma in Professional and Clinical Veterinary Nursing, being awarded overall highest marks gained by the RVC. Jo has worked as head nurse at SCVS, before becoming nursing mananger in 2015, responsible for managing the whole nursing team.